Smt. Hyma Potineni, National General Secretary and Sri Bheesetti Babjee, AP State General Secretary have stated in a Press Release on Friday that the 9th Anniversary Celebration Programme on 7th November in Anantapur is the platform to announce the Action Plan to protect the future well-being of all the 13 districts of Andhra Pradesh in a holistic manner. They extend a cordial and warm invitation to the people of AP and all the Party leaders and activists, especially the youth to attend the meeting that will be addressed by Dr.Jayaprakash Narayan, who will be the Chief Guest. They pointed out that it is very interesting to note that all the mainstream Parties are now talking about these very issues, which, indeed, is a welcome and happy outcome. Even though the Party does not enjoy any representation in the Assembly, they will strive relentlessly to realise the above demands. 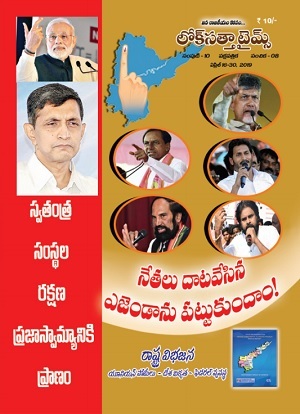 They released the details of the Anniversary Programme, being organized by the AP wing of Lok Satta Party. Meeting of the District level Representatives in Ramnagar Function Hall, Anantapur to discuss and pass Resolutions on Political Action Plan for the future of the State. Public Meeting near Saptagiri Circle - Dr. JP’s Address on Special Status to AP and Constructive Solutions to end Rayalaseema Backwardness. Smt. Hyma Potineni stated that the LSP has proved that it is possible to run a Political Party based on ethics and people-oriented principles, which was the most cherished dream of our freedom fighters and Constitution-makers. Smt. Hyma and Shri Bajee thanked all the donors and contributors. 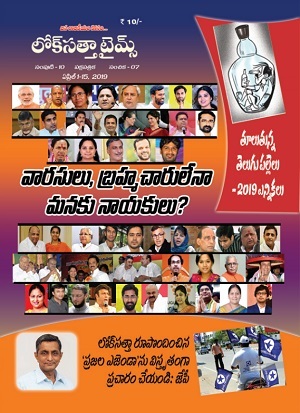 Amidst the depressive scenario wherein the mainstream parties are grabbing power through unhealthy practices of spending unaccounted money, promising non-implementable poll-promises, unethical hate-mongering through divisive tactics, and thereafter, feathering their cozy nests through humongous corruption and leaving people to their fate, Lok Satta is still able to bring in the last 15 years, not less than 15 fundamental reform Laws through Constitutional Amendments, even though it enjoys no political clout or power. Honest politics need honest money. And for this purpose, Lok Satta is the harbinger of Constitution amendment (2003) Bill that facilitates tax exemption to donations to political parties and thereby paving a new road to good politics. Lok Satta is the only platform that enables the capable youth of our country to participate in politics based on their caliber and not on factors such as caste, religion, language, money and muscle power, regional parochialism, etc., which are presently ruling the roost. They called on everybody to come forward to collectively nurture and strengthen the new culture of politics based on honesty, personal integrity and caliber. GHMC spends Rs 5 k to vaccinate 1 dog!